Syrian government forces are reportedly advancing further into Palmyra, battling Islamic State militants for control of the ancient city. The official Sana news agency reported that troops had taken a reconstructed 13th Century castle perched on a hill to the west of the Roman-era ruins. 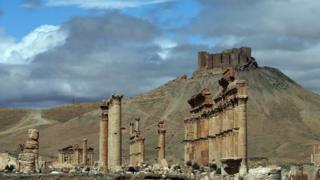 IS seized the Unesco World Heritage site and adjoining modern town in May. The jihadist group, which has also demolished several pre-Islamic sites in neighbouring Iraq, believes that such structures are idolatrous. Syrian state media and activists reported that there was heavy fighting between government forces, backed by Russian air strikes, and IS militants on the outskirts of Palmyra on Friday. In the morning, troops took full control of the so-called SyriaTel Hill on the western edge before taking the nearby castle, known as Qalaat Shirkuh or Qalaat Ibn Maan, a military sources told Sana. Pro-government Al-Mayadeen TV said the castle, which sits on a 150m-high hilltop overlooking the ruins, was of strategic importance. The Syrian Observatory for Human Rights also said the fighting had reached the edge of the ruins. The UK-based monitoring group added that Syrian and Russian warplanes had struck at least 56 targets inside areas still controlled by IS. The IS-linked Amaq news agency meanwhile published what it said was video footage from inside the modern town adjoining the ruins on Thursday. It included what appeared to be buildings damaged in fighting or air strikes. Government forces briefly entered the town on Thursday but were pushed back. The prospect of its liberation was welcomed by Unesco, the UN's cultural agency, which has described the destruction of Palmyra as a war crime. "For one year, Palmyra has been a symbol of the cultural cleansing plaguing the Middle East," said its director-general Irina Bokova. "The dynamiting and pillage of its treasures, to break an entire society, sparked a unanimous indignation and strengthened the unprecedented mobilisation in favour of the values that unite all humanity." Ms Bokova said Unesco was ready to go to Palmyra as soon as security conditions allowed to evaluate the damage to the ruins and protect what remained. Recapturing Palmyra would be a significant victory for the government and Russia, which withdrew most of its forces last week after a six-month air campaign against opponents of President Bashar al-Assad that turned the tide of the five-year civil war in his favour. In addition to its ruins, Palmyra is situated in a strategically important area on the road between the capital, Damascus, and the contested eastern city of Deir al-Zour.